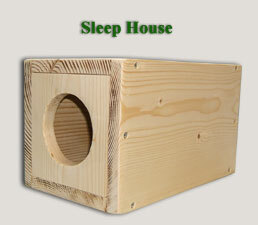 If you looking for a cage that is chinchilla safe then you've come to the right place. Below is a sampling of what we have available. If you don't see what you like contact us for details on custom designing your own. We also offer expert help and advice on helping you choose the right cage for your little critter. Click here to see our customer reviews page. 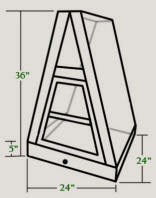 The above is our special A-FRAME cage. This cage is built with light pine in the frame and in the shelves. Because chinchillas love to chew pine, the shelves are designed to be easily replaced. 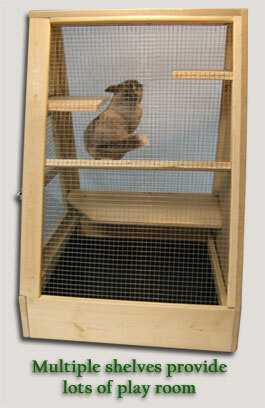 The height of this cage and multiple shelves provides the chins with plenty of space to jump, climb or just lay around. The two large shelves are tilted to allow for debris and droppings to roll off into the tray bottom. The back wall can be solid or wired. Either way your chins get plenty of light and air circulation plus it's great for viewing. The bottom simply slides out like a drawer for cleaning. The cage is delivered fully assembled. Just add feeder, water bottle, and your favorite chins. Fill out our Contact Us form for more information or to order with special shipping. 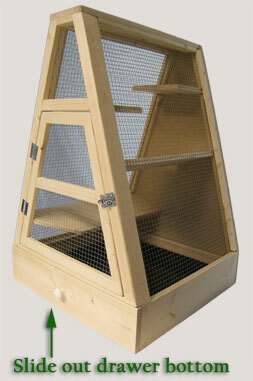 Our Travel Cages are constructed of pre-sanded pine plywood for a strong but light weight unit that will last for years. We hand sand the wood even more for a smooth finish. 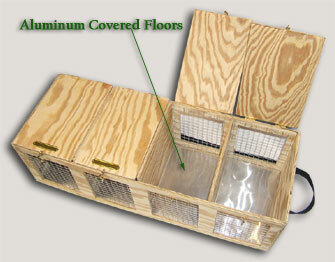 The floor of the cage is covered with sheet aluminum. The walls in between each individual compartment are sealed with silicon to prevent runoff from one to another. Each unit has brass latches and hinges plus a strong nylon carrying strap. Name card holders are optional. 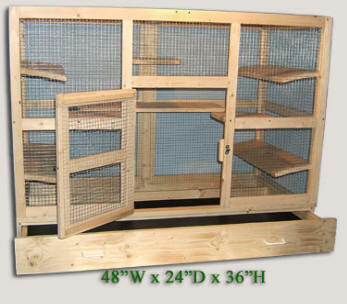 A 4 compartment cage, as pictured above, sells for $100 plus shipping, completely assembled. 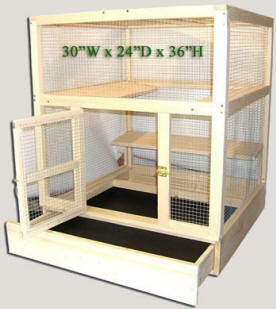 You can order one as seen here or send us your specifications for a quote on a custom built travel cage. They can be constructed with any number of individual compartments but we recommend no more than five. You can use our Contact Us form to request more information. 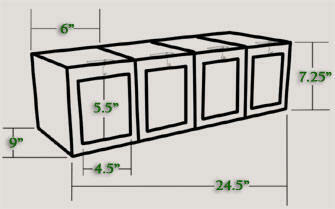 The measurements shown here are approximates and may vary slightly in the finished product. Note: This cage is not intended for the shipping of chinchillas. 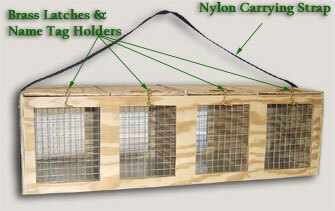 It is designed as a convenient Travel Cage for personal supervised transport of chinchillas only. If you are looking for shipping cages let us know and we can help you with those also. 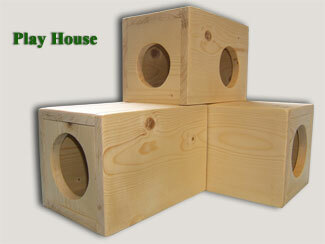 In addition to our cages we also build other items for chinchillas. Below are a couple samples of things we have found that chinchillas really enjoy.